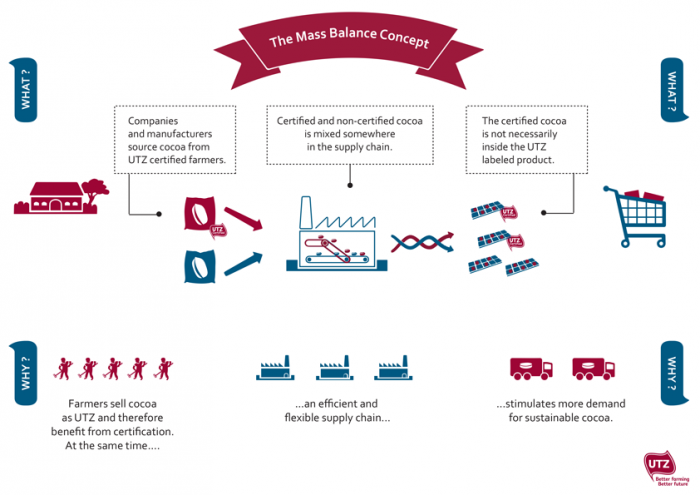 In order to bring the benefits of certification to as many cocoa farmers a possible, UTZ uses a system called ‘mass balance’. What does ‘mass balance’ mean? In the cocoa industry, cocoa beans are generally supplied in bulk and mixed during shipping and manufacturing, which in most cases makes it impossible to keep certified cocoa separate from non-certified cocoa. This is very different from other sectors like coffee. In order to bring the benefits of certification to as many cocoa farmers a possible, UTZ uses a system called ‘mass balance’ which is also used, in one form or another, by the other main sustainability initiatives. When a company purchases certified cocoa using mass balance, it means that the certified cocoa was produced by an UTZ certified farmer, but was not kept physically separated from non-UTZ cocoa throughout the whole supply chain. When you see an UTZ label on a product, for instance a chocolate bar, you can rely upon the fact that the manufacturer of that particular bar has purchased UTZ certified cocoa. To be specific, it purchased the exact amount of UTZ certified cocoa necessary to produce that bar – even though the UTZ certified cocoa might not have ended up in that specific bar but in other products. Thanks to the flexibility offered by the mass balance system, more farmers can benefit from certification, because it encourages companies to make the transition towards buying sustainable cocoa. For farmers, it doesn’t matter whether the cocoa they sell ends up in one chocolate bar or another. What matters to them are the benefits they experience, such as higher productivity, bigger incomes, and better living conditions. How are ‘mass balance’ products labeled? Products with the UTZ label always have information explaining what the label means for that product. UTZ has set clear rules describing what is allowed and what is not. You can tell whether a company used the mass balance system by checking the text on the back of the pack of any UTZ-labeled chocolate products. Manufacturers of cocoa products which use mass balance state on product packaging that “By buying UTZ certified cocoa, we support sustainable cocoa farming,” and are not allowed to state that the product contains certified cocoa. When the text says: “By buying UTZ certified cocoa, we support sustainable cocoa farming,” you will know that the cocoa bought from UTZ certified farmers was mixed in the supply chain, so it may not be in that specific product. When the text says: “The cocoa in this product was grown by UTZ certified farmers,” you’ll know the product itself contains the cocoa grown by UTZ certified farmers. How does ‘mass balance’ differ from other ways of sourcing cocoa? Mass balance is by far the most commonly used model in the cocoa industry and other sustainability initiatives such as FairTrade and Rainforest Alliance also use mass balance in one form or another. Besides ‘mass balance’, there are two other models, in which UTZ certified cocoa remains physically separated from non UTZ cocoa. They are called Segregation and Identity Preserved. Segregation means that certified cocoa is kept separate from non-certified cocoa throughout the whole supply chain, although cocoa from different UTZ-certified farms may be mixed. Identity Preserved means that certified cocoa from a specific certificate holder (usually a cooperative made up of small farmers) is kept separate from other cocoa throughout the whole supply chain, so it is possible to know which farmer group produced the cocoa in a specific product. The impact for the farmer is the same in all three models. For the farmers, what matters is that they experience the benefits of certification: higher productivity, bigger incomes, and better livelihoods. So for them it doesn’t matter whether the cocoa ends up in one product or another. Can you give me an example of mass balance in cocoa? A company needs 4,000 bags of cocoa to make its chocolate bars, and 4,000 bags of cocoa to make its chocolate cookies. The company buys 4,000 bags of cocoa from UTZ certified farmers and 4,000 bags from non-certified farmers, and this cocoa all gets mixed together somewhere between the farm and the factory, before the products are manufactured. This means it is not possible to know which products contain the certified cocoa. The company puts the logo on the chocolate bars but not the chocolate cookies. Why is it that only the chocolate bars carry the UTZ Certified logo? That’s because the amount of certified cocoa bought only covers the volume of cocoa needed for the chocolate bars. How can I be sure that the claims made by UTZ are reliable? Credibility is assured by the UTZ Certified traceability system and Chain of Custody certification. The traceability system records all the certified cocoa that is bought and sold throughout the supply chain, and makes sure that every label and claim is backed up by certified purchases. The Chain of Custody certification means that supply chain actors are audited to make sure they follow certain requirements for handling certified cocoa. Why does UTZ need to encourage companies to source sustainable cocoa? UTZ’s mission is to make sustainable farming the norm. We are constantly working to increase sales of UTZ certified cocoa, as this is how we can extend the benefits of certification to more farmers, workers and their families. Making the switch to sustainable sourcing can be a huge undertaking. The cocoa supply chain is complex, and if certified and non-certified cocoa had to be kept separate throughout the whole supply chain then many companies would decide that sourcing sustainable cocoa was too challenging. Thanks to mass balance we have seen an incredible increase in both supply and demand of UTZ certified cocoa, with many of the world’s biggest chocolate companies making major commitments. And that means a bigger impact for farmers. Do other international sustainability initiatives like Fairtrade and Rainforest Alliance use mass balance too? I heard the UTZ mass balance system is changing. Will this have an effect on the cost of certified cocoa? When a company purchases UTZ certified cocoa using mass balance, it means that the certified cocoa was produced by an UTZ certified farmer, but was not kept physically separated from non-UTZ cocoa throughout the whole supply chain. Therefore the UTZ cocoa might not have ended up in the UTZ labeled product but in other products.